When your smile is missing a tooth, or more than one tooth, it affects your health. Additionally, your work, your social life, and your emotions are also affected. As a dentist London residents trust with their smiles, same day crowns, and oral hygiene needs, give us a call if you want to improve your smile. We utilize the latest in dental technology to give you back your smile and your life. Crowns, bridges, and other restorative dental procedures are services our London, KY dentist offers in order to restore your smile, your confidence, and your health. If you aren’t sure what these services can do for you, we’re happy to walk you through their benefits. Today, let’s look at how a dental bridge can improve your smile and oral health. The loss of a tooth can be the result of an injury, gum disease, a health problem, and even from neglecting your oral hygiene needs. Without the tooth, other teeth can shift into the empty space; exposing more enamel to decay possibilities. 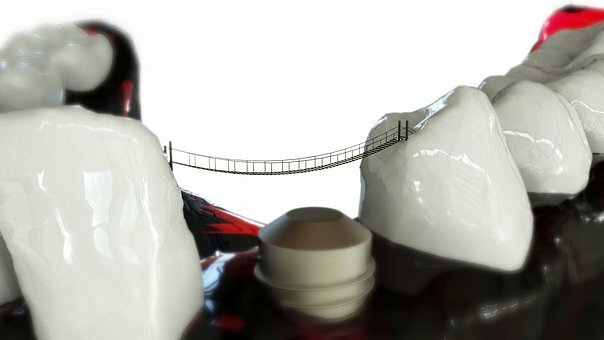 A bridge secures a replacement tooth in its place and is anchored in place by your existing teeth. Occasionally, a crown is used to stabilize the bridge. A bridge can be used if one tooth or more than one tooth is missing. Depending on your oral hygiene needs, it can be fixed in place or removable. Bridges keep neighboring teeth supported, reduce your risk of periodontal disease, and keep your oral health in good condition. Typically, one or two visits to our London, KY dentist are all it takes to get your new bridge. At your first appointment, we take an impression of your mouth and prepare the mouth for your bridge. We may use a temporary bridge, if necessary, to prevent teeth from moving and to protect your existing teeth. The impression is used to create your new teeth. At the second appointment, we will fit you with the bridge that has been designed uniquely for you. Also, you can expect minor adjustments to be made while you’re in our office so that the bridge fits properly and comfortably. Future dental exams with our London, KY dentist will always check the device to ensure it continues to fulfill your oral hygiene needs. The best way you can take care of your bridge is to continue with proper oral hygiene needs such as brushing and flossing daily. Brush your teeth and bridge two times each day and floss daily. Depending on your bridge, you may need to look into water flossers to ensure the tissues around your bridge get the attention they need to remain healthy. A dental bridge is a great way to restore your smile. Give us a call if you are ready to learn more or follow us on Facebook for more about our restorative dental procedures. We work hard to help our London, KY dentist patients receive the oral health care they need to keep their smiles looking great.